CAN urges sacrificial living as Nigerians mark Palm Sunday – Royal Times of Nigeria. 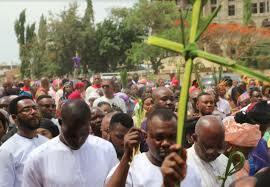 The Christian Association of Nigeria, Oyo state chapter, on Sunday urged Christians to take advantage of the significance of Palm Sunday to imbibe the culture of living a life of sacrifice. Chairman of the branch Pastor Benjamin Akanmu who made the call in Ibadan today also urged Christians to emulate the humility, love, and selfless service of Jesus Christ, which made Him to die on the cross for the salvation of mankind. He called on Christians to live a life of positive impact in the society and to draw people to Christ even as they do those things that would be acceptable before God. Also speaking, the Pastor of All Saints Anglican Church, Koroduma, Nasarawa, Reverend Alexander Okoye, said Palm Sunday was celebrated to commemorate Jesus Christ’s triumphant entry into Jerusalem. Okoye said that it showed the humble, peaceful nature of Jesus riding on a donkey as a king rather than a warhorse. He urged Christians to know Jesus as their savior, burden bearer and lord, while calling on them to emulate His humility, gentle as well as peaceful nature.